Tooth decay is when a hole (cavity) forms in your tooth*. This can be very painful and it can make it hard to eat, sleep and talk. Tooth decay can start as soon as your child’s baby teeth appear. 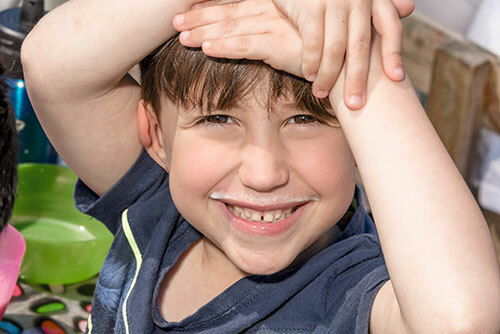 Keeping your child’s teeth clean and healthy is the best way to prevent tooth decay. Teeth need to be cleaned two times every day. You can use a cloth for your child’s first baby teeth then use a brush when their molars start to grow. You should help your child brush their teeth until they are about 8 years old. When your child is old enough to spit, they can start to use toothpaste.Fluoride toothpaste that is right for your child’s age is best. But be careful not to use too much! Your child only needs a small amount - about the size of a pea. You should start visiting a dentist when your child is 1 year old. You can visit a private dentist or a free dental service. For free dental treatment in Sydney Local Health District phone 9293 3333. Your child should visit a dentist regularly and at least once a year. You don’t need to wait for your next dentist appointment to look for early signs of tooth decay. You can do it yourself! 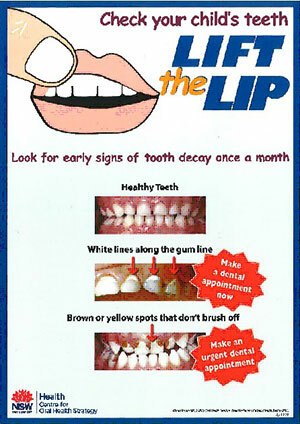 Lift up your child’s lip once a month and look for signs of tooth decay. If there are white lines on your child’s teeth just under the gum that do not brush off, make an appointment with your dentist. If you see black, brown or yellow spots that do not brush off, make an urgent appointment with your dentist. These need to be treated straight away. Healthy teeth are part of a healthy body. Tooth decay can lead to health issues such as heart disease in adult life. Tooth decay is one of the most common chronic diseases that children under 5 go to hospital for.